While the Wildlife Center and biologists with the Virginia Department of Game and Inland Fisheries were able to foster a cub onto a wild denning sow earlier this year, the end of March proved to be too late in the season to successfully find a foster mom for the first cub. Sows become more active in the spring weather and start leaving their winter dens with their cubs in early April. The second, third, and fourth cub were admitted to the Wildlife Center within the weeks following the first cub's admission. Bear cubs at the Wildlife Center are rehabilitated for a year and are released in the following spring, at the time when they would begin naturally dispersing from their mothers. The 2017 cubs will be released in the spring of 2018. To limit human interaction, only a few staff care for the bear cubs. Cubs admitted in the early spring typically need supplemental heat; they live in one of the Center's patient rooms and are bottle- or bowl-fed a special bear formula multiple times a day. When they are old enough to move outside, they continue to live in a contained zinger crate, with access to a larger play space during feeding sessions. After that, the cubs are housed in the Center’s Large Mammal Isolation enclosure. Once the bear cubs are weaned from formula, they are moved to the Center’s Black Bear Complex, where they have a half-acre of forest to explore. Here's a look back at the bears of 2017, with a focus on No Tag (our first cub of the 2017-2018 season) and Red Tag (always our biggest cub of the season)! On the morning of Thursday, April 5, the Wildlife Center veterinary team was able to successfully dart and sedate Black Bears #17-0744 [Yellow Tag], #17-0411 [Green Tag], and #17-0374 [Red Tag]. The bears each received an examination and skin scraping; everything was within normal limits. Each bear received a green ear tag in both ears prior to loading into the DGIF truck for release. Dr. Peach, wildlife rehabilitator Brie, wildlife rehabilitation intern Shannon, director of outreach Amanda, and outreach coordinator Raina were able to attend the release with two DGIF biologists. Red Tag, who was loaded last and separated in the bear trap from the other two bears, appeared to be the most alert and was released first. The bear was still a little sleepy, but walked off into the woods. Dr. Peach “reversed” the other two bears’ sedation with an additional injection of drugs, and the team waited for about 20 minutes while the bears woke up. Both were still a little wobbly and were slow to jump out of the truck. Once they did, they both walked off into the woods. After the release team came back to the Wildlife Center, Double Orange Tags [#17-2065] and Double Yellow Tags [#17-2035] were darted, sedated, examined, tagged, and loaded into the DGIF truck. They'll be released early this evening. On the morning of April 3, the Wildlife Center team was able to successfully dart four bears: #17-0352 [No Tag], #17-0745 [Pink Tag], #17-0606 [Orange Tag], and #17-0444 [White Tag]. Each bear was examined and had blood drawn and a skin scraping, all of which were negative for mites. The bears received a green ear tag in each ear, were weighed, and loaded into a bear trap on a DGIF truck. They’ll be released early this afternoon by a DGIF biologist. Final weights – and photos! The next set of bears will be darted and picked up on Thursday morning; the final bears may be picked up on Thursday afternoon. Afternoon Update: Katie, the DGIF biologist who released No Tag, Pink Tag, Orange Tag, and White Tag today reported in this afternoon that everything went well! She told wildlife rehabilitator Brie that there were a couple of bears who were a little sleepy when they came out of the bear trap, but all four bears headed straight for the woods. One even climbed a tree right away to get farther away. The first of the bears are leaving tomorrow! Wildlife rehabilitators Brie and Shannon will try to trap three or four bears in transition area #2 on Monday afternoon. Drs. Peach, Monica, and Ingrid will be darting those bears on Tuesday morning; each bear will be examined, weighed, and ear tagged [a green tag in each ear] prior to release. The bears will also get a quick skin scraping to do one final check for mites. If all goes well, those bears will be loaded into the Virginia Department of Game & Inland Fisheries transport trap and will be taken by the biologist to a remote location for release. On Thursday, April 5, two more bears will be picked up by a different VDGIF biologist. Several staff members will attend Thursday’s release. Wildlife rehabilitator Brie has been planning bear release dates with multiple biologists with the Virginia Department of Game & Inland Fisheries. The yearlings will be split up into three groups, and the first group is scheduled to leave on Tuesday, April 3! The biologist will report to the Center in the morning; the veterinary team will dart and sedate the first three or four bears that can be safely contained in one of the transition areas of the Bear Complex. Plans are still being made for the rest of the bears; it’s likely that they will be picked up later next week. Despite the recent snow in Waynesboro, it’s spring and nearly time for the Black Bears of 2017 to be released. Wildlife rehabilitator Brie has been in touch with several biologists with the Virginia Department of Game & Inland Fisheries about release dates for the yearling bears. Many bears are tentatively scheduled for release during the first week of April – just two weeks away! This time of year closely matches the natural dispersal time for Black Bears in Virginia – many sows and their offspring from last year are emerging from dens in April, and the yearlings are ready to go off on their own. The warm April spring brings a lot of wild, natural foods, too – bears will be eating grasses and other plants, as well as insects and larvae. The bears will be released in groups of threes or fours at different locations in Virginia. The DTM test for Black Bear cub #17-0745 [Pink Tag] did show positive results for ringworm, which is a common fungal infection of the skin. Wild animals can be exposed to the fungus without developing symptoms, but some animals will develop itching and hair loss. The veterinary team met to discuss options for treatments; because the fungus is in the bear complex environment, the staff won't entirely be able to eradicate the fungus. However, the veterinary team will treat this issue in two ways this week: first, by spraying a topical medication; second, by applying a medication to the den areas (where the bears congregate) via medicated paintballs. Not all of the bears are exhibiting symptoms of the ringworm fungus, but the staff will attempt to treat all of the bears to prevent further problems. On February 8, the wildlife rehabilitation team was able to trap Pink Tag in transition area #2 in the Black Bear Complex. Dr. Monica darted the yearling bear for a full examination. Once the bear was safely anesthetized, the team performed a physical examination and several skin scrapings, drew blood, and took hair samples. Dr. Peach noted that the bear had a thinning hair coat on her chest and near her rump, along with some matted hair on her rump. Overall, there wasn’t a significant amount of hair loss. The bear weighed in at 37.3 kg. Pink Tag recovered well in the transition area, and the team decided to leave her contained in that space until all diagnostic work was performed. Licensed veterinary technician Jaclyn analyzed the skin scraping later that afternoon and found no signs of mites. Blood work was within normal limits. A dermatophyte test medium (DTM) was set up to culture for the ringworm fungus; the team will know early this week if the yearling has ringworm. The Black Bears of 2017 have been doing well in the week’s following their big “birthday party”. Wildlife rehabilitator Brie reported that while the bears eagerly tore apart their presents on the day of the party, they actually did not finish their cake! Overall, the bears have been a little slower during the coldest periods of weather, and the rehab staff is currently skipping a food delivery on Mondays since the bears have plenty of food (and reserves). The team has continued to monitor the bears and their behavior via the Critter Cams. The rehab staff and a volunteer have taken regular shifts to watch the bears to check for signs of barbering [chewing of hair], which could explain why some bears have a shorter hair coat in some areas. The staff has not seen bears barbering one another, though they have seen some bears self-barbering. They also noted that Pink Tag’s hair coat appears to be worsening, with what appears to be true hair loss. The rehab staff began feeding the bears in transition area #2 during the week of January 29, and hope to be able to trap Pink Tag in the transition area so the veterinary team can evaluate her. The 10 Black Bear cubs in the Wildlife Center’s Bear Complex are doing well – while the cubs may have slowed down during the extreme cold snap early in January, they are still up and active every day, which is not uncommon for bears of this age in Virginia. The bears have access to two half-acre yards and can often be found hanging out in trees or cuddling together in and around the dens. Earlier this winter, the team noted that some of the cubs are experiencing some issues with their hair coats; it looks very similar to hair coat issues that were seen in last year’s crop of bears. The hair isn’t missing; rather, it’s broken off near the base. Dr. Ernesto suspects this is due to “barbering” – chewing, likely by other more dominant bears. The team is carefully assessing behavior in-person and via Critter Cam. Samples were also taken from some favorite scratching trees and dens; at this point, there are no indications of fungus or mites. The bear cubs enjoy regular enrichment in their enclosures; this week, they received a Chewy box full of goodies! Next week, they’ll enjoy even more – January 17 is considered to be their “parturition day” – the median date in Virginia when Black Bears are born. This means we’ll consider them yearlings as of next Wednesday! The 10 Black Bear cubs have been doing well in the Center’s Black Bear Complex; the wildlife rehabilitators have been offering extra food since the bears are in “hyperphagia” – that is, the cubs are eating more during this fall season to put on some winter weight! Last week, the bears were moved to yard #2 in the complex so that some repairs could be made in yard #1; this work should be done this week, and wildlife rehabilitator Brie anticipates opening the connecting gate between yard #1 and yard #2 on November 1. The rehab externs are busily preparing some Halloween-themed enrichment this week; the bears have a pumpkin with their names on it waiting in the animal kitchen! On August 22, wildlife rehabilitator Brie decided that Black Bear cub #17-2065, Double Orange Tags, should be large enough to move to the Black Bear Complex. The rehab team was successfully able to lure the cub into a live trap with grapes; the cub was then transported to the complex and was released into the main yard. On July 25, the rehabilitation team started moving the 2017 Black Bear cubs to the Bear Complex! 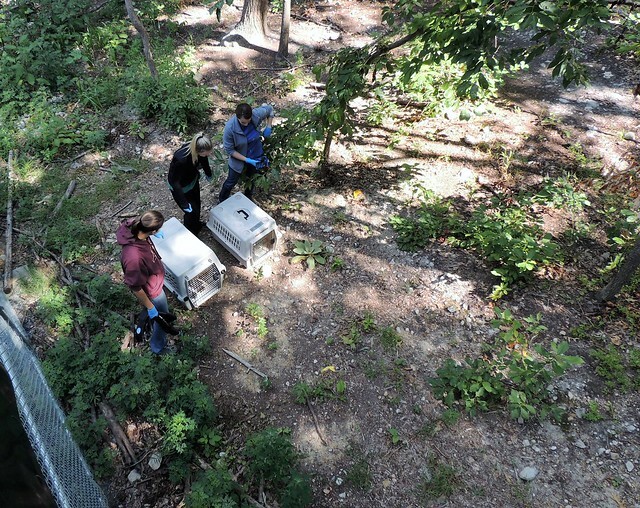 Wildlife rehabilitator Brie and wildlife rehab interns Shannon McCabe and Shannon Mazurowski were able to contain four bears – No Tag, Double Green Tags, Yellow Tag, and Red Tag – in crates and moved them to the yard quickly. Pink Tag, White Tag, and Orange Tag had to be live trapped in the Large Mammal Isolation enclosure; each of the bears fell for their baited trap fairly quickly. Green Tag remained behind for an examination from the veterinary team; the bear was seen limping on cam early this morning. In the complex, each of the bears wasted no time exploring the yard – each was up a tree within a matter of minutes! Double Green, Yellow, and Red hung out in a large tree and spent quite a bit of time climbing up and down the tree, while their sister No Tag was in the next-door tree for a short time. The bears now have a half-acre to explore, and will no doubt be busy in the coming days! Green Tag received his examination from Drs. Peach and Ernesto in the afternoon; Dr. Ernesto noted that one of the cub’s front legs was mildly swollen, but radiographs were within normal limits. Without any significant problems, the veterinary team gave him an anti-inflammatory and decided to move Green Tag to the yard with the other cubs. On Saturday, July 8, the rehabilitation team noted that Yellow Tag had a small patch of crusty skin on his neck; on Sunday, the lesion looked a little worse, so the rehab team enclosed the cub in the connecting chute of the enclosure so that the cub could be fasted and then easily sedated on Monday. It’s likely that the bear may have sustained a small injury while rough-housing with his siblings, but the veterinary team wants to check to ensure that the cub doesn’t have ringworm or mange. No Tag has been weaned from bottle-feedings, and all of the cubs are currently receiving a juvenile bear meal, including soaked dog chow, fruits, veggies, and insects. The staff are making a few repairs to the Bear Complex before the nine cubs are moved to their new space this summer. The nine Black Bear cubs have been doing well -- many Critter Cam viewers have enjoyed watching them eat, play, and sleep together … the cubs appear to have a lot of energy! On June 14, the cubs will have a chance to expend more energy by testing out a bear-proof clamp for a trash can. Last year, a sixth-grade FLL Lego Robotics team in the Richmond area -- The Brickheads -- contacted VDGIF Black Bear Project Leader Jaime Sajecki, to consult on a bear-proof trash can attachment. The attachment is designed to be an easy, affordable way to make trash cans bear-proof; the sixth-grade team members who worked on the project over the fall and winter were eager to see if any of the Wildlife Center bears could test the final product. Within five minutes, Red Tag and Yellow Tag began getting into the trash can; Yellow Tag bit off a piece of foam under one of the clamps, which allowed the clamp to loosen. Wildlife rehabilitator Brie pulled the trash can out of the enclosure. The Black Bear cubs of 2017 have been doing well at the Wildlife Center. They are rambunctious and playful, and are increasingly a handful for the rehabilitation team! The cubs receive a variety of enrichment -- toys, food, branches, and other special items. On June 6, wildlife rehabilitation extern Ianna made the bears a tightly braided sheet rope for them to climb; wildlife rehabilitator Brie supervised the cubs while they investigated this new toy. She also recorded the event via GoPro -- four of the cubs also got a little "cam enrichment" that day as they check out the GoPro camera. The bears are still eating mush bowls twice a day, and the first cub of the season, No Tag, has still been receiving a bottle. On Tuesday, No Tag was more interested in the other food and enrichment items. Brie, who is the primary bear rehabilitator, reported, "No Tag didn't want her bottle for the first time on Tuesday. While I'm glad she is finally growing up, it broke my heart a little. This must be what parents feel like when their kids go off to their first day of kindergarten." On Thursday, June 8, Cub Cam started streaming again on Critter Cam 2! At the end of last week, the rest of the bear cubs were moved to the Large Mammal Isolation enclosure. Bear cub #17-0760 [Double Green Tag] was isolated for a few more days until he was cleared to move in with the other cubs on May 15. Wildlife rehabilitators Brie and Linda report that the cubs are active, wild, eating, growling, playing, and just generally crazy. The cubs are eating soft bear foods and receiving mush bowls twice a day; the youngest cub, No Tag, is still being bottle-fed twice a day. On May 3, wildlife rehabilitator Brie moved Red Tag, Green Tag, and White Tag to the Large Mammal Isolation enclosure. These three bears are the largest of the cubs, and the Center's metal cage complex, where the cubs had been housed, was getting a little full! The three cubs began tentatively exploring, and have settled in well. They are currently eating mush bowls twice a day, in addition to other veggies, fruits, and seeds. The other cubs -- No Tag, Orange Tag, Yellow Tag, and Pink Tag -- are still housed in zinger crates in the metal cage complex and roam and play during meals three times a day. No Tag, the youngest cub, is the only one still bottle-feeding; all the other cubs have graduated to mush bowls. Double Green Tag -- the newest arrival -- still has been housed alone due to his mange mites. The staff hope that he'll be clear to meet the other cubs next week. The five Black Bear cubs are doing well at the Wildlife Center; all are eating and gaining weight! The cubs are currently housed in two zinger crates in the Center's outdoor metals complex, where they can have supervised playtime while smelling and hearing the outdoors. On April 27, three of the cubs were brought into the clinic so that the veterinary team could anesthetize them, take radiographs, and ear tag them. Fortunately for Hospital Cam viewers, the cubs woke up from anesthesia while on cam! The four Black Bear cubs have been doing well at the Center; they will soon make the move to the Center's outdoor metal cage complex, where they'll remain in their zinger crates in between supervised play and feeding sessions. They'll move to the Center's Large Mammal Isolation enclosure, likely in mid-May. The cubs will each soon receive a colored identification tag in one ear. Here are some recent photos of a bear cub play session!